Specializing in a premiere intimate boating experience around the island of Wrightsville Beach, we are dedicated to providing you and those special to you a sunset adventure you'll never forget. La Dee Dah Sunset Cruises provides top quality sunset cruises at a reasonable cost. With a limit of 6 guests of per adventure, our sunset cruises provide a customizable and intimate experience complete with hors d'oeuvres, beverages, and the sights and sounds of the island. Growing up on the waters of Wrightsville Beach fishing, surfing, and working as life guard all shaped the Captain’s story. 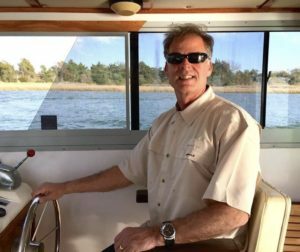 Captain Axel and his wife and first-mate, Patti, are eager to welcome you aboard the La Dee Dah, a 27 foot Coastal Yacht, and experience the wonders of this NC island. Patti, the First Mate of the La Dee Dah is happy to welcome you aboard. 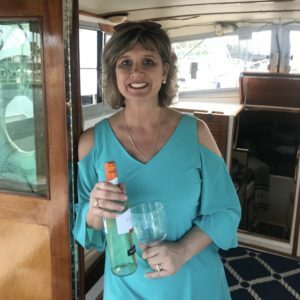 She is easily one of the best wine pourers on Wrightsville Beach, and is delighted to share her love of the water with you as you experience Wrightsville Beach Sunsets the very best way possible – on the water!